DapperLads - Holiday Browns Knickerbocker Set - Knickerbockers - US made Victorian fashion boys knickerbockers sets with genteel nostalgic appeal. The Holiday Browns DapperLads original look. With the timeless appeal of Victorian era knickerbockers, DapperLads offers a comfy, yet dressy holiday look for this popular style. 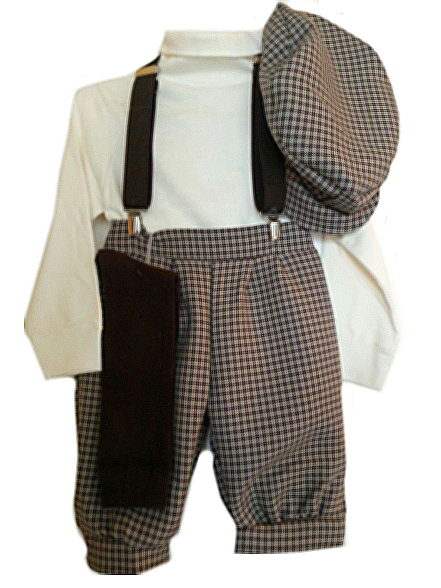 The 5 - piece brown checked boy's Knickerbockers complete outfit adds a cozy 100% cotton ivory turtleneck to the brown check wrinkle-free polyester knicker pants, cap and bow tie. Included in the set are brown elastic suspenders and knee socks. The outfit runs small. It is recommended to Order up a size. Pair with retro classic brown saddle shoes.